BSE UK recently undertook work for Lens Online, a company that is part of the well known opticians, Specsavers. Lens Online’s warehouses are stocked with fragile lenses and other associated equipment, which needs to be well organised and available for easy picking without any risk of damage. Following an initial conversation and site visit, Dexion P90 Pallet Racking with Interoll Carton Flow System was recommended and installed. Pictured below is the P90 Pallet Racking system. Dexion P90 wide aisle pallet racking is one of the most flexible and economical racking systems we have available at BSE UK, access to pallets is unrestricted and systems can be built up to 30 metres high with no limitation on the layout, this is what makes the P90 such a reliable go-to option for a wide range of picking operations. In addition to being so flexible, Dexion P90 pallet racking can be adapted to meet your business needs through a wide range of accessories including column guards, aisle marking systems and flow systems as shown below. 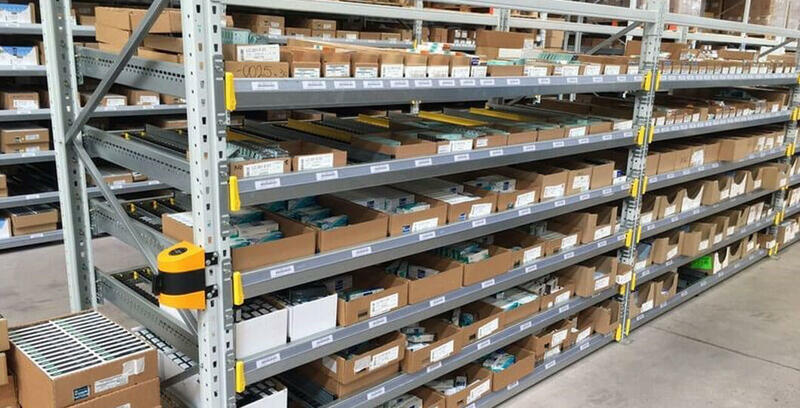 A key product used within the racking system of this job was the Interoll Carton Flow System, designed to improve the flexibility of the picking process in distribution and fulfilment centres. You can see the flow system in action below, with products gently rolling to the front of the racking system allowing for easy operative-facing picking with zero damage to the stock. 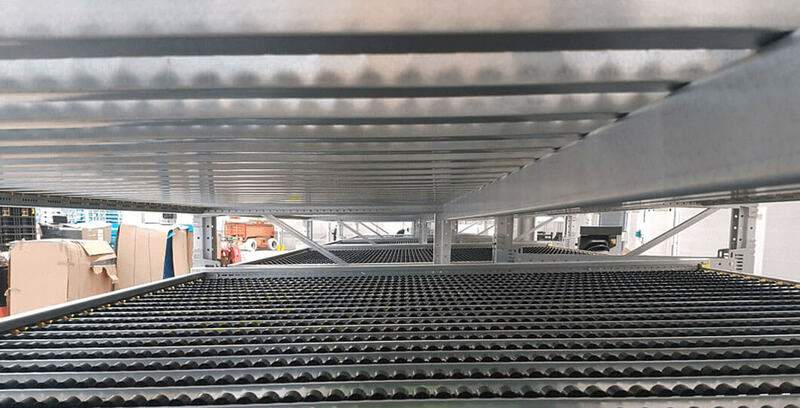 These systems of great flexibility in operations where dimensions and weights of goods vary, and with 90% space utilisation – your valuable racking space isn’t going to waste. Bay Type 1 – 2700mm clear entry bay x 2000mm high frame x 1100 deep each face. Each bay fitted with 6 carton flow levels. Bay Type 2 – 2700mm clear entry bay x 2000mm high frame x 2200mm deep each face. Bay Type 3 – 2700mm clear entry bay x 7500mm high frame x 1100 deep each face. Bay Type 4 – 2700mm clear entry bay x 7500mm high frame x 1100 deep each face. 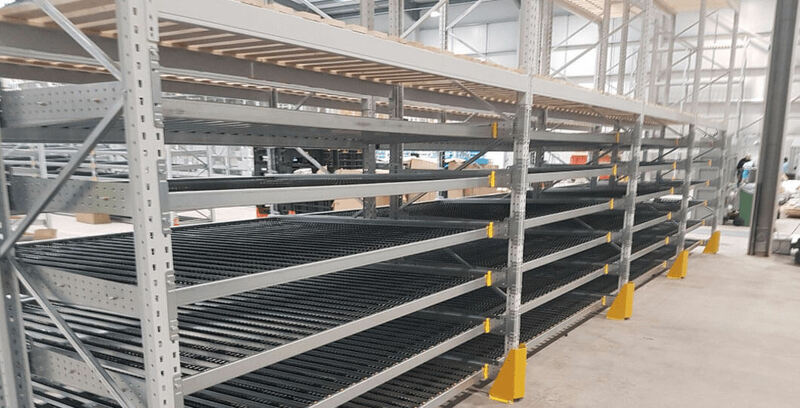 Lens Online were delighted with their new racking system, allowing for a faster, flexible and more efficient picking process in their warehouse. If you have questions regarding the Dexion P90 pallet racking, Interoll Carton Flow System or any of our other products – give one of our expert team a call on 0117 955 5211.